Mix the garlic, olive oil and cumin seeds with some salt and pepper in a small bowl. Pour this over the lamb and rub it into the meat. Place the lamb in a deep casserole dish with the whole peeled shallots, celery and leek and pour over the stock. Cover with a tight-fitting lid and cook in the oven for 3 hours, until the lamb is cooked through and soft to touch. Remove the casserole dish from the oven. 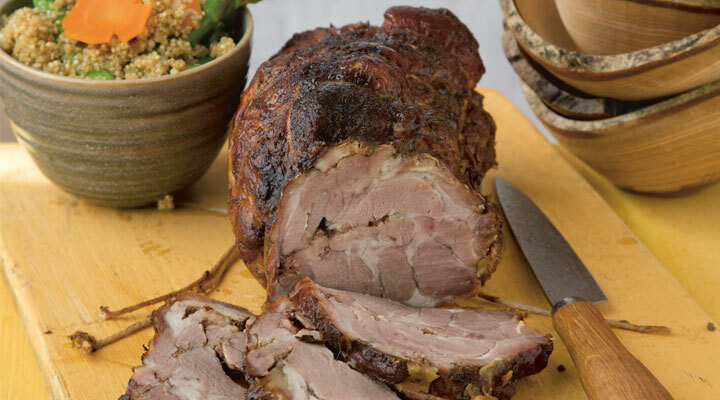 Take the lamb out of the dish, place it in a roasting tin and glaze with the honey. Reserve the cooking liquor from the casserole dish. Increase the oven temperature to 180°C/gas mark 4. Return the lamb to the oven for 15 to 20 minutes to crisp it up. Remove the lamb from the oven and leave to rest, loosely covered with tin foil. Meanwhile, rinse the quinoa well and place it in a saucepan with the water and a pinch of salt. Bring to the boil and cover with a lid, then reduce the heat and gently simmer for 10 minutes, until the grain unwinds. Turn off the heat and leave to cool slightly, then drain off any remaining water, fluff up with a fork and season with salt and pepper. Using a large spoon, remove any surface fat from the top of the cooking liquor in the casserole dish and discard the fat. Add the carrots, asparagus and courgette slices and return to the hob for 3 minutes to heat through. Add the quinoa and chopped mint and stir to combine. Transfer the quinoa and vegetables to a large warmed serving dish. Remove the string from the lamb and carve into thick slices. Sit the lamb on top of the bed of vegetables and quinoa to serve.